Yep, the TWO days of MOTOMOTO are fast approaching! 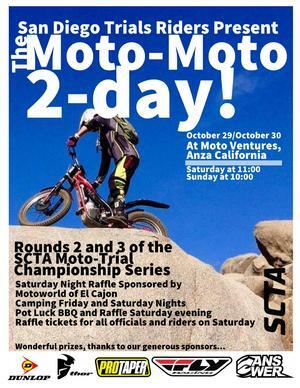 MOTOMOTO represents rounds 2 and 3 of our illustrious and amaze-balls SoCal Trials Championship Series, and is hosted by the fine boys from the South, the San Diego Trials Riders. Awesome prizes, a full-on saturday night barbecue, camping, and more. Held at MotoVentures, the SDTR trials masters have lovingly concocted not 10, but TWENTY of the finest sections ever built, ever. Ever. For the FIRST time ever, I get to be on a flier. How cool is that? Much more info on the events page, and here's a flier to download for your fridge.